I bought way too much of this Classic Elite (Pebbles) cottony white yarn, and I knew that if I didn’t do something soon, it would join countless other skeins (referred to as my “stash”) that wait patiently for me in a huge plastic footlocker in the basement. I picked up a copy of Best of Terry Kimbrough Baby Afghans and chose the pattern called Heirloom Lace. Working on it here-and-there, it took me about two weeks to complete. Not bad at all. The center panel moves along quickly, but the pretty outer edging takes a bit of concentration. I think I’ll put this one away with my Irish Knit Baby Blanket as one of those keepsake treasures. Hi Annie, Can you do a sweater and hat to match? What a beautiful job. You have the touch and the love to go with it. I usually knit baby sweaters, but I think a little crocheted sweater and hat would be perfect! I’m heading over to Ravelry. Absolutely beautiful ! You (almost) inspire me to crochet, like when you (ahem) encouraged me to buy that book on one of our yarn runs. And I have a suggestion for the other 10 skeins of yarn….send them to me ….made up into an afghan to go on the back of my couch. You have that book…really?? Visiting your library would have saved me $7. See what your moving away has done? So far, Kris’s suggestion is best. I have other yarn that I’d GLADLY send for you to put that book to good use. How do you feel about pink cotton…a WEB’S special. The baby blanket is absolutely gorgeous! I don’t know what the yardageor weight is for the yarn you used, buit I have two suggestions: Lion Brand’s golden honey shrug and Crystal Palace’s Panda Silk DK Fan Shawl. Both are free p[atterns which yopu can find on the yarn website’s or on ravelry. Both, by the way, are knitted patterns. Glad you liked the blanket, Rosemarie. I checked out the patterns on Ravelry, and I especially liked the Fan Shawl. If I don’t use this particular yarn, I certainly have many other choices on hand. Thanks for making those suggestions! Maybe you’ll be a much quicker crocheter than you are a knitter. I have a hook with your name on it…let’s get the party started! Hi, I am about three months pregnant and looking for a good “labor project” to focus on. I’d debated trying quilting, but when I saw this, I fell in love! How advanced would you say this is? Total beginning here basically. Haven’t crocheted more than a scarf in years. Can you also share your hook size, the exact yarn details and how many skeins you used? Don’t laugh…You don’t wash the yarn before you start, do you? Thanks! Gorgeous work! Congratulations…you have so much to look forward to! Honestly, this blanket is not nearly as complicated as it looks. The basic stitch is a shell comprised of 5 double crochet in a stitch or a space. If you can do a single-crochet and a double-crochet, you are good to go. If you are unsure of either of these stitches, refer to you-tube tutorials, which are of great help. I used a size H hook and the yarn was Classic Elite Pebbles, which may no longer be available. Do not fret, though, because any sport weight or dk yarn will do. I used 10 skeins of dk yarn, each 110 yards, but the pattern specifically calls for 1,400 yards (14 oz.) of sport weight yarn. I am laughing about the yarn-washing because I have done lots of quilting and there is an on-going debate about whether to pre-wash the fabrics. There are definitely two different camps: the washers vs. the non-washers. I was always a non-washer, but my dearest friend threw all her fabric in the washer as soon as she bought it. The same, however, does not apply to yarn (at least, not that I know of). I always use the yarn straight from the ball to start my knitting or crocheting. 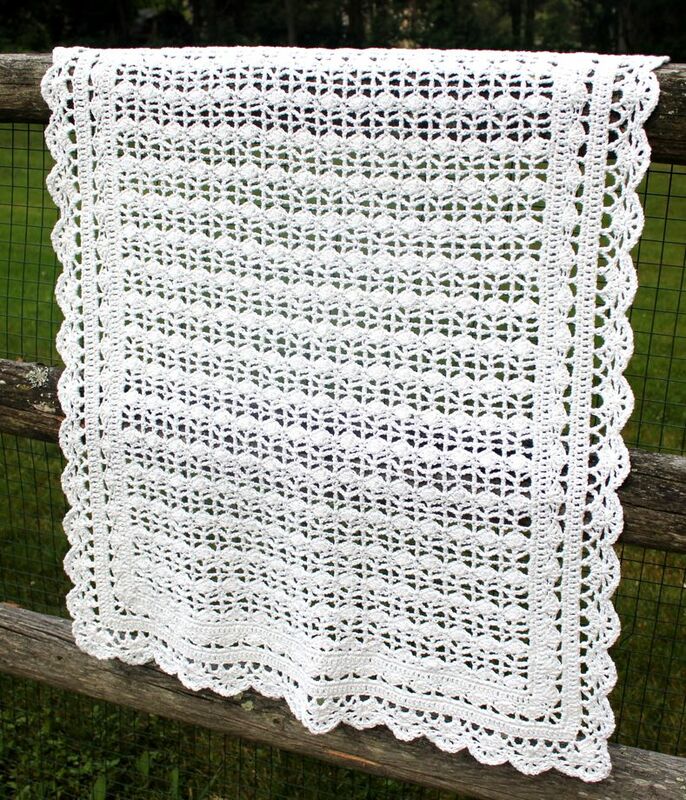 Since you are making a baby blanket, be sure to use yarn that is washable. 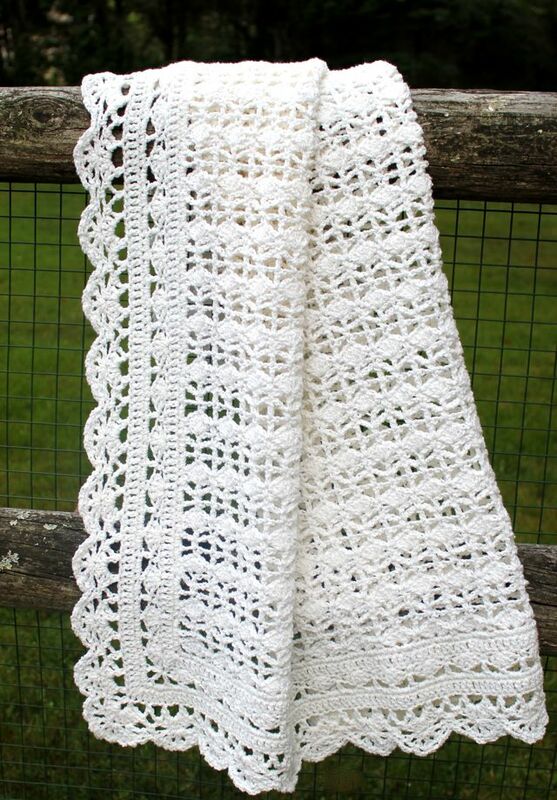 Love the blanket and plan to make it for my grandson’s christening (who won’t even be born until next month!). How many skeins of yarn did it take? The pattern calls for 1,400 yards of sport weight yarn. The yarn I used was a dk weight, and it took approx. 1,100 yards, which was about 10 skeins. This blanket works up very quickly, so you should have plenty of time to complete it before the christening. Congratulations to you and your family! so do I have to buy this? You haven’t given a free pattern hey? Thanks so much for the reply! Just to re-fresh my memory, I just started on a very single baby blanket to practice my single crochet/double crochet, but am thrilled to hear that the heirloom lace pattern isn’t terribly difficult! I figure I have 6 months to work on it! Haha, the fabric washing is about as far as I got with my first quilt I’m embarrassed to admit, but I’m glad I don’t need to worry about pre-washing my crochet matertials or I imagine I’m never start. I’ll be sure to share my work once I’m done. Thanks again! Hello Ann, I have made this blanket probably a dozen times or more. It is my favorite baby blanket to make. I make the center in a pastel color and then on the dc round I do in white to mimic a ribbon. Years ago I adapted the pattern and made a triangle shawl for myself. I didn’t write down how I adapted it and not sure I could do it again. So glad to find someone who likes the pattern as much as I do. Hi Wanda! It is a beautiful pattern, and I love the idea of using a pastel color in the center with a white “ribbon” look. I’d like to give that a try. I’ll bet the shawl is lovely, and I’ll also bet that if you tried it again, you could do it again!! Hi Ann! First, you do beautiful work! I’d like to buy this pattern, but would like to make it larger than a baby blanket. Do you by chance know the multiple of the starting chain so it could be worked up larger? Or does the pattern specify? Just wondering before I buy. Thanks! 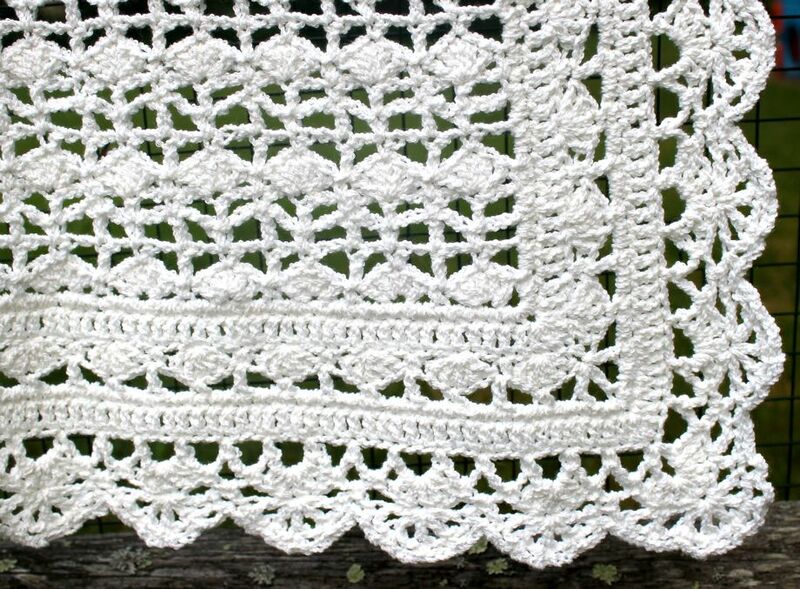 What is the point of showing the heirloom lace blanket if the pattern is not available at all – stupid if you ask me !!! !